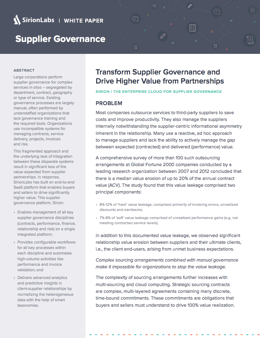 Strategic sourcing relationships typically suffer value erosion of up to 20% of ACV when managed using traditional supplier governance models. The traditional governance approach, already limited in effectiveness due to its manual nature, is further constrained by the use of incompatible systems across the organization for managing contracts, performance, invoices, relationship and risk. This makes it impossible for organizations to stop the value leakage. Download this whitepaper to learn how the above challenges can be addressed through a technology-driven, integrated governance approach.